Blanchard Grinding is best suited for single-sided material removal and grinding applications too large for double-disc grinding. 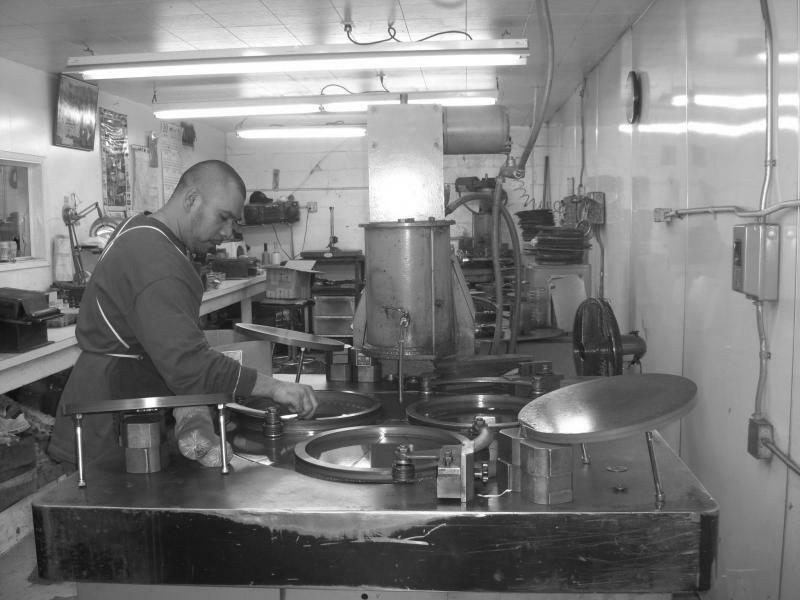 Blanchard grinding, also known in the industry as rotary surface grinding, quickly removes stock from one side of a part. 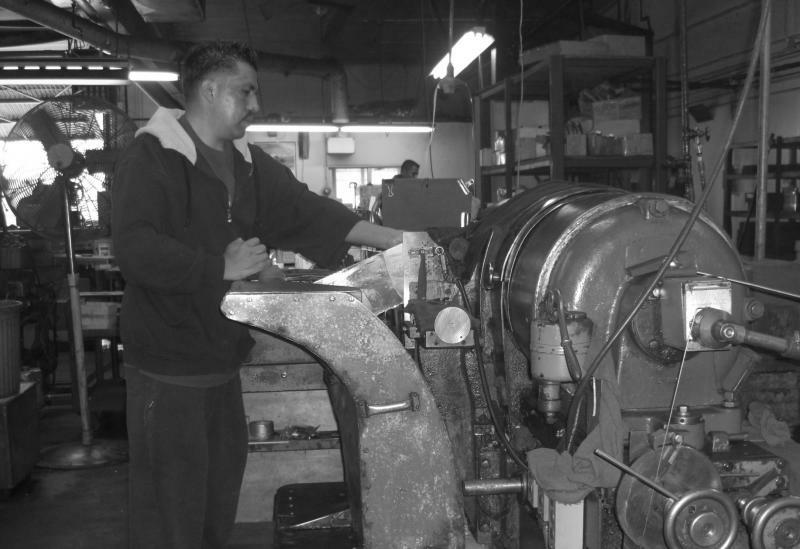 Parts with a size of 36″ × 42″ can be Blanchard Ground on our machine. Dimensional tolerances to ± .001", parallelism to .001", and flatness to .001" are achievable on all our Blanchard Grinders. Parallelism and flatness tolerances to .001"
While ideal for large parts like mold plates, rotary tables or vacuum chambers, Blanchard Grinding can also be an effective method for simultaneous grinding of multiple smaller parts. 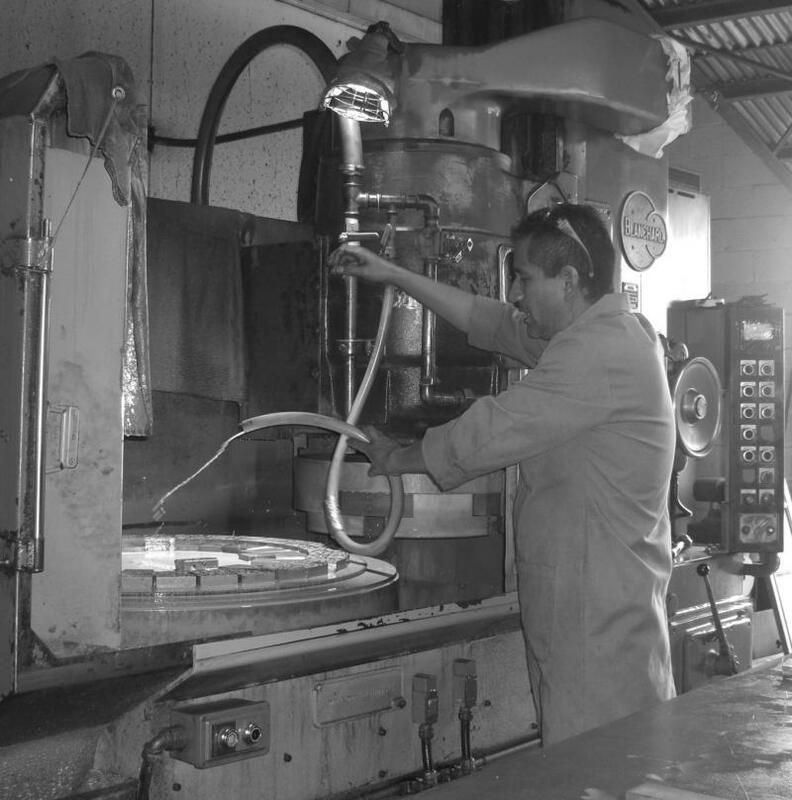 Pre-machining costs and turnaround time can be greatly reduced by Blanchard Grinding multiple parts. Multiple part grinding, along with cutting a large, Blanchard Ground blank into smaller parts, provides uniform part-to-part thickness tolerances and surface finishes at a lower unit cost. Flat Lapping is a precision process or combination of processes used to provide flatness, parallelism, size and surface finishes to extremely demanding tolerances. 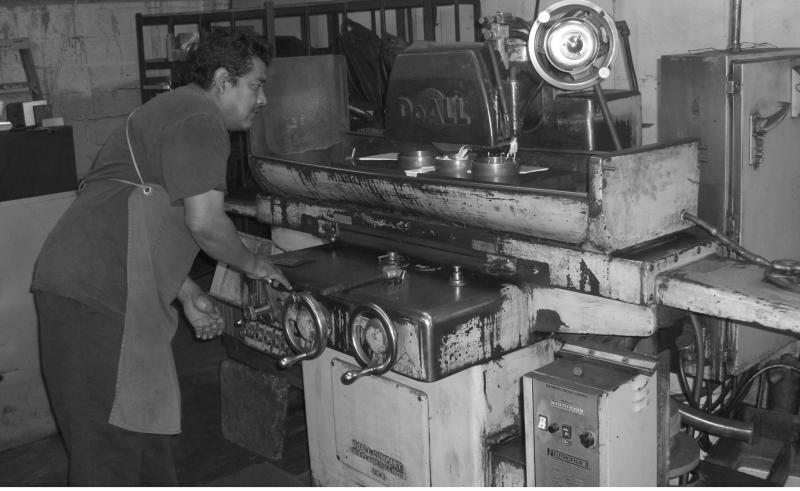 Flat Lapping and fine grinding are processes used where the surface finish, flatness, or parallelism of the work piece must be held to very close tolerances. Flat Lapping can achieve a flatness rating of one millionth of an inch (0.000001"), parallelism tolerances of ten millionths of an inch (.00001") and surface finishes to 0.4Ra using special handling and tooling techniques. Flat Lapping is a highly efficient surface finishing process using horizontal revolving plates. Flat Lapping produces less heat and stress on parts than other finishing applications. Because of this, parts that are thin or sensitive to heat and/or stress will respond to flat lap better than other processes. Flat Lapping provides flatness, parallelism, and thickness of parts to customer specifications. It also provides a smooth surface finish. Tolerances typically held for flatness are .000020 (2 light bands) and parallel within .0001. Double-Disc Grinding is the most reliable and cost effective process for your pre-machining needs. Double-Disc Grinding is a highly efficient grinding method that reduces pre-machining costs up to 50% and provides dimensional tolerances, parallelism, and flatness to ±.0002". Double-Disc Grinding uses two opposing abrasive wheels to simultaneously grind two sides of a blank. In one operation, equal amounts of material are removed from both sides. Surface Grinding is the most common of the grinding operations. It is a finishing process that uses a rotating abrasive wheel to smooth the flat surface of metallic or nonmetallic materials to give them a more refined look or to attain a desired surface for a functional purpose. Surface grinding processes include methods like vertical-spindle rotary, vertical swivel head, horizontal spindle single disk, vertical spindle, and horizontal spindle grinding. Surface grinding produces a relatively flat surface when compared with other conventional grinding techniques. Typical work piece materials include cast iron and minor steel. These two materials don't tend to clog the grinding wheel while being processed. Other materials are aluminum, stainless steel, brass and some plastics. When grinding at high temperatures, the material tends to become weakened and is more inclined to corrode. This can also result in a loss of magnetism in materials where this is applicable. The typical precision of a surface grinder depends on the type and usage, however +/- 0.0005 (+/- 0.0001") is achievable on our surface grinders.